DVB Debate: How to reach reconciliation in Arakan State? Few issues in Burma evoke the kind of passionate debate — and, often, disagreement — as the situation in Arakan State, where the ethnic Arakanese Buddhist and Rohingya Muslim communities were torn apart by inter-faith violence in 2012. In the years since, conditions for the latter have deteriorated and solutions to the protracted tensions between members of the two religions remain elusive. October brought a further setback as militants — whom the government has said were inspired by Islamist ideology — attacked three border police posts, killing nine officers. Last week the UN Human Rights Council decided to establish an international fact-finding mission to probe alleged rights violations resulting from security forces’ crackdown in northern Arakan State since the 9 October attacks. Central to the broader dynamics at play in Arakan State is the Rohingya’s claims to citizenship. While many members of the Muslim minority say they trace family roots in the state back generations, most in Burma regard them as illegal interlopers from neighbouring Bangladesh. In this episode of DVB Debate aired last month, panelists discuss how to approach issues of citizenship, conflict and reconciliation between the bitterly divided communities in the western Burmese state. This video has been edited down from the original DVB Debate program, which aired on 25 February. The full debate, in Burmese, can be watched here. Spectacular points totally, you recently received the latest readers. What exactly might you advise in terms of the publish you manufactured at times in past times? Almost any particular? I have been surfing on-line a lot more than a few a long time nowadays, nonetheless I personally in no way located almost any interesting article just like you. It really is stunning cost adequate for me personally. Personally, when virtually all webmasters and also blog owners manufactured fantastic material while you does, the online world will likely be much more valuable than before. i came to “return the favor”.I’m trying to find things to enhance my site!I suppose its ok to use a few of your ideas!! Appreciation to my father who stated to me on the topic of this web site, this website is actually remarkable. every day by reading thes pleasant articles. submit upper! Come on over and talk over with my site . 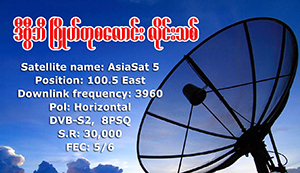 How to reach reconciliation in Arakan State?- DVB Multimedia Group <Liked it!